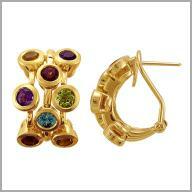 These earrings are crafted in your choice of polished 14K white or yellow gold. Each features various round cut 3.5mm gemstones, including: two each citrine and amethyst, and one each blue zircon, pink tourmaline, peridot and garnet. All stones are in bezel settings alternating in three rows for precious visual alure. The total citrine weight is 4.00ct, zircon weight is 2.00ct, tourmaline weight is 2.00ct, peridot weight is 2.00ct, amethyst weight is 4.00ct and the total garnet weight is 2.00ct (all approximate). They measure 3/8" x 3/4" and have posts with lever backs.